Lucy and Chester's Amazing Adventures! 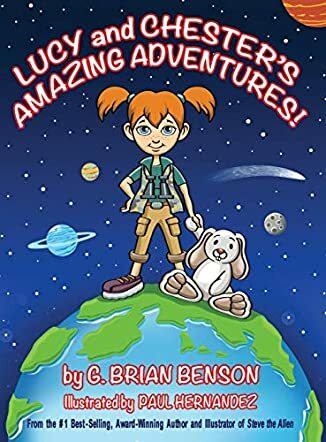 Kids will love Lucy and Chester’s Amazing Adventures! by G. Brian Benson. Told in rhyme and beautifully illustrated, each page holds delight for the young reader. Lucy is a Dora, the Explorer kind of girl. She and her stuffed bunny, Chester, go to sleep each night with dreams of places to go and things to do. They sail over treetops, mountains and streams. They travel to China, England, Egypt and France. They are astronauts, cowboys, and actors. They swim with dolphins and polar bears, they ride with yaks and visit the Queen of England. They hang out with a monk, some monkeys, and parrots. They travel to Mars before heading home to cuddle and begin more adventures. I loved Lucy and Chester’s Amazing Adventures! G. Brian Benson’s theme of dream and you can be anything is very well handled. I can see this book being used in classrooms and with parents for discussions of “what do you want to be when you grow up?” I also think it would be a wonderful resource for Career Day for several grade levels. The beautiful artwork by Paul Hernandez grabs young readers' interest and provides much in the way of discussion of all of the events that Mr. Benson shares. In social studies classrooms, Lucy and Chester’s Amazing Adventures! could be used as an introduction to the core curriculum that is taught in a typical fifth grade classroom. I would recommend this book for classroom use from first through fifth grades.